Aligarh, September 16: Departments, faculties, schools and offices of the Aligarh Muslim University (AMU) observed the Government of India initiative, ‘Swachh Bharat Pakhwada’ with cleanliness drives and awareness campaigns. Prof Mohammad Nasiruddin (Chairperson, Department of Pharmacology) led the ‘Swachhta Pakhwada’ cleanliness drive in the Department of Pharmacology, Jawaharlal Nehru Medical College (JNMC). All the department teachers, including Dr Jameel Ahmad and Dr Syed Ziaur Rahman participated actively in the drive. Department of Chemistry organised a poster-making competition on ‘Innovative ways for spreading the message on hygiene’ and an elocution contest on ‘Health and hygiene is the real wealth.’ Prof M Shakir (Dean, Faculty of Science and Chairperson, Department of Chemistry) sensitised students and staff to participate in the drive and pledge to keep India clean. Prof M Muneer was the programme organiser. Centre of Continuing and Adult Education and Extension conducted a cleanliness drive during which Dr Shabbar Habib Alvi (Deputy Director) emphasised on the importance of cleanliness. Dr Shamim Akhtar, Ms Mujahida and Mr Jawed Alam were also present. Faculty of Unani Medicine observed ‘Swachhta Pakhwada’ with all faculty members, staff and students volunteering to clean the Faculty area. In a separate programme organised by the Faculty’s Department of Tahhaffuzi wa Samaji Tib, Prof S M Safdar Ashraf said that they have distributed Swachhta advocacy handouts. An Essay writing competition was also organised for the observation. Dr S P Singh (Dy. Chief Medical Officer, District, Aligarh) attended the programme as the Chief Guest. Dr Ali Jafar Abedi (University Health Officer), Dr Saud Ali Khan (Principal, Ajmal Khan Tibbiya College), Dr Abdul Aziz Khan, Dr Ammar Ibne Anwar, Prof Abu Waris Jamil and other academicians were present. Department of Geography organized a cleanliness drive on the occasion. 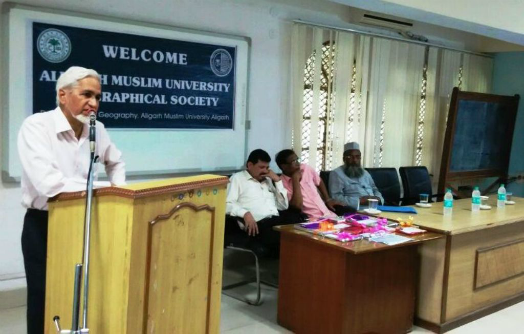 Prof Abdul Muneer (Former Dean, Faculty of Science) was the chief guest. Prof Atiq Ahmad (Chairperson, Department of Geography) deliberated views on the importance of hygiene. Prof Saeed Ahmad conducted the programme, while Mr Hizbul Rehman (Vice Pesident, Geographical Society) proposed the vote of thanks. Elocution and poster-making competitions were also conducted. The Provost, wardens, students and staff members of the Nadeem Tarin Hall observed the cleanliness drive in the Hall premises and adjoining areas. Professor Malik Shoeb Ahmad (Provost, Nadeem Tarin Hall) informed that the resident students and staff of Hall pledged to keep working for cleanliness. AMU ABK High School (Boys) observed ‘Clean Campus Day’ by organising a special assembly session on ‘Cleanliness of Environment’. Dr Mohd Abbas Niazi (Principal) emphasised on importance of hygiene, sanitation and cleanliness. Meanwhile, Hardik Prasad Singh and Kunal Rajour of standard X and IX respectively won the essay writing competition organised on the occasion. The school also conducted a ‘Green Campus Day’ by planting tree saplings in the school premises. ‘Clean Class Day’ and ‘Clean Campus Day’ were also organised by the school.